The 29-year-old hijacker was performing midair stunts over Puget Sound, an erratic flight pattern that seemed to mirror the loops and barrel rolls of his radio chatter. He told the control tower he was "a broken guy" but a lot of people cared about him and he wanted to apologize. He asked the whereabouts of an orca whale and her dead calf. And he wondered – laughing – what would happen if he tried to do a "backflip" with the plane he had stolen from Seattle's main airport. When the control tower urged him to attempt to land the empty, 76-seat Bombardier Q400 belonging to his employer, Horizon Air, the man – identified by a law enforcement official as Richard Russell – worried about harm to others on the ground. Better to take a nose dive, he said, "and call it a night." The stunning heist of a large commercial airplane from a major U.S. airport Friday night took no other lives than the pilot's, but the incident has heightened worries about gaps in American aviation security, forcing questions about how Russell, a baggage handler and grounds crew member, could take control of the aircraft, get it in the air and fly it willy-nilly over a major U.S. metropolitan area for nearly an hour. As he flew in loops and zigzags into the sunset with Air Force F-15s shadowing him, spectators on the ground followed him across the sky with their phones, thinking it was an air show. Within minutes of the theft, the two F-15s were scrambled and were in the air, flying at supersonic speeds from their Portland air base to intercept the aircraft, according to the North American Aerospace Defense Command, which oversees airspace protection in North America. The jets were armed but did not fire on the aircraft, said Air Force Capt. Cameron Hillier, a NORAD spokesman. Officials declined to describe the circumstances in which they would bring down an aircraft with a missile, citing operational security, but Hillier did say any decision would involve "a lot of collaboration" between pilots, commanders on the ground and others. The F-15 pilots attempted to divert the aircraft toward the Pacific Ocean while maintaining radio communication with controllers and Russell. The jets flew close enough to make visual contact, Hillier said. Russell eventually told controllers that fuel was low and an engine was failing. 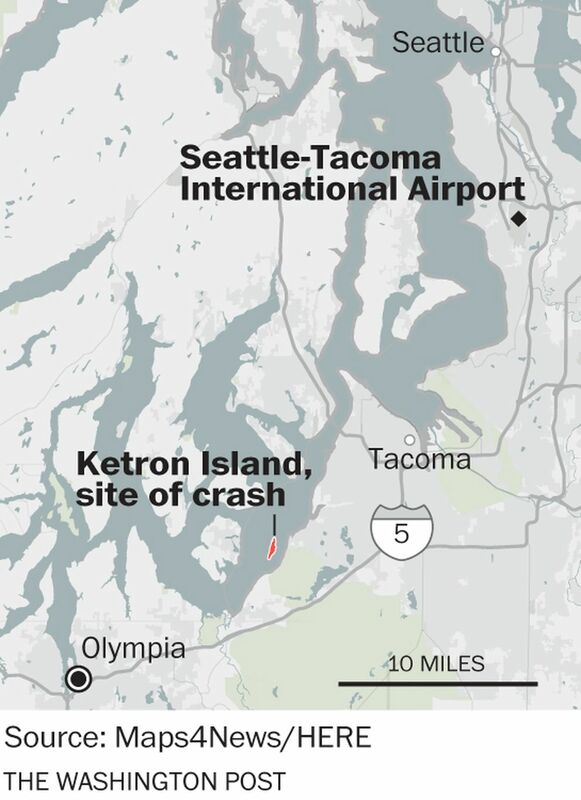 Then he plunged the aircraft into a wooded area on sparsely inhabited Kentron Island, 25 miles south of the Seattle-Tacoma International Airport, setting trees ablaze. Federal officials released few details Saturday about the hijacking, but airline executives said Russell had been an employee since 2015, and he possessed security clearances to gain access to the plane. He was also familiar with the towing tractors that move aircraft on the tarmac. He used one to back the plane out of a maintenance area, then climbed into the cockpit and roared down the runway. 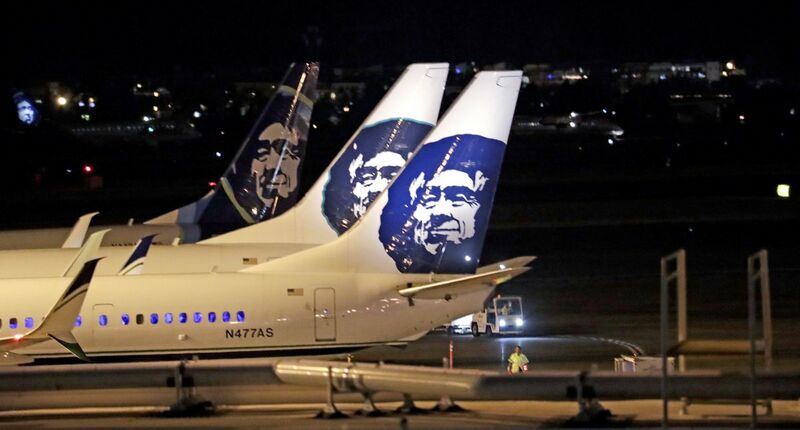 Brad Tilden, the CEO of Alaska Airlines, which owns Horizon Air, told reporters Saturday the incident "is going to push us to learn from this tragedy and make sure this does not happen again at Alaska or any other airline." But he and other airline executives declined to say what measures they could take to prevent someone with security badges from doing it again. Tilden said his industry operates on the principle of checking the backgrounds of employees, not locking down airplanes in secure areas. "The doors to the airplanes are not keyed like a car," he said. Congress is already seeking to tighten the screening of airport employees and may do so with more urgency now, said Mary Schiavo, the former inspector general of the U.S. Transportation Department. The United States has approximately 900,000 aviation workers, according to the most recent federal data, and Schiavo said screening procedures are "pretty rudimentary." While pilots undergo periodic medical exams, she noted, airline mechanics and ground crew members are checked on a much more limited basis that does not include mental health exams. Though aircraft mechanics have broad access and routinely taxi planes along the tarmac, Schiavo said, ground crew members are not supposed to be allowed inside cockpits, which have locking doors. But she said those security procedures are not always observed, especially for smaller commuter aircraft such as the Bombardier Q400. "It can be a little more casual and a little loosey-goosey, especially if they are doing overnight maintenance," she said. Authorities were quick to assure the public that Friday's incident was not viewed as an act of terrorism. But the apparent ease with which the Horizon employee stole the plane points to the challenge of stopping "inside threat" attacks. Richard Bloom, an aviation security expert at Arizona's Embry-Riddle Aeronautical University, said he wasn't aware of another incident in the United States in which a ground crew member managed to steal an airplane. Incidents of aviation workers attempting to aid terrorists or drug traffickers are far more common globally. But setting up a comprehensive screening system to evaluate the mental health of aviation workers would be difficult, Bloom cautioned, and it would risk rejecting large numbers of workers who do not pose a danger. "There are such significant challenges to preventing inappropriate security behavior," he said. "It's kind of surprising that these types of things don't happen more often." A bipartisan House bill, approved last year, calls for more stringent standards in employee background checks and increased surveillance of secure areas at airports. A Senate version of the bill has yet to come up for a vote. The bill followed a February 2017 House Homeland Security Committee report warning of vulnerabilities that could allow terrorists and criminals to get jobs as aviation workers. Concerns over mental health were not a focus of the report. But those worries have increased in recent years, analysts say, particularly after the 2015 crash of a Germanwings flight, whose co-pilot deliberately steered the plane into a French mountainside, killing 144 passengers and five crew members. The co-pilot, Andreas Lubitz, had been treated for depression and psychiatric problems but concealed the information from his employer. Once the flight was airborne, Lubitz locked his more senior pilot out of the cockpit. Gary Beck, the CEO of Horizon Air, told reporters he didn't know whether Russell was trained as a pilot, but he called the flight "incredible." At one point, an air traffic controller urged Russell to land at the airfield of a nearby military base, Joint Base Lewis-McChord. "Oh man," Russell said, "Those guys will rough me up if I try and land there. I think I might mess something up there, too. I wouldn't want to do that." Russell described his experience flying in video games and asked for the coordinates to the orca whale that has been pushing her dead calf through Washington state's coastal waters for nearly three weeks. "You know, the mama orca with the baby," he said. "I want to go see that guy." Resources: Contact the National Suicide Prevention Lifeline for 24-hour, confidential assistance if you or someone you know needs help: 1-800-273-TALK (8255), suicidepreventionlifeline.org. The Washington Post's Devlin Barrett contributed to this report.